With over 12 years in the transport sector, Imaginet offers benchmark setting digital solutions to meet objectives. From smartcard portals and ticketing to journey planning solutions and data collection. We’ve been developing ITSO smartcard portals for 6 years and offer a range of services that can be tailored to match your needs perfectly. All our portals integrate with a third party CMS, (we know ACT and ESP really well) and, we’ll include functionality to match your scheme, rather than a one size fits all approach. Helping you to provide transport solutions to universities, local businesses and even your own staff, we can provide an enterprise version of our portals that allows you to manage smartcards in bulk. Particularly useful where paper period passes are still being used, this solution can put the organisation in full control of their transport provision for staff or students, it’ll help eliminate fraud too. 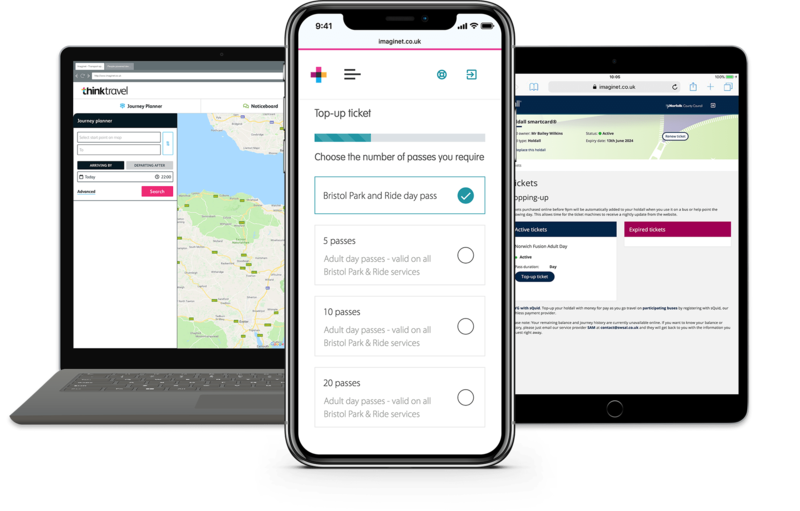 Our experience in rail and bus working with First, Go Ahead and many Councils has given us an edge in passenger information and complex third party data integrations—and we’re continuing to innovate. We're currently developing the DfT funded Total Transport project, now called Thinktravel, which will combine travel information from multiple council systems to deliver more complete options of travel for customers using mapping and clever search techniques. A key part of this is a Travel Noticeboard encouraging users to post their transport requirements that aren’t being easily met by existing services and connect with potential suppliers, helping you solve mobility challenges. At the back office, we’re collecting essential search and user data to compile intelligent findings that can help direct future services and in turn improving well-being for residents. Save time, resources and even avoid a tendering process by using one of the transport frameworks Imaginet is part of. Imaginet is the preferred smartcard portal supplier for the SAM Managed Service, if you don’t wish to manage all the working parts of your scheme internally. The framework also offers the normal route to call-off suppliers via mini-competition or direct award, with extended services beyond a standard portal such as journey planning and even loyalty schemes. The ESPO Framework offers a direct route to award for smartcard portals for concessionary and commercial offerings. Imaginet can be called off via direct award or mini competition. Can I sell commercial tickets in my concessionary smart portal? Yes, commercial tickets can be made available to concessionary smartcard customers and once paid for, can be added to the card just like a concessionary ticket. This means that customers won’t need several smartcards as all the transport tickets they need can be held on one smartcard. Can a smartcard portal manage corporate travel schemes for employees or students? Yes, our enterprise level portal will allow smartcards to be issued and managed in bulk with complete control being given to the manager in the organisation if desired. 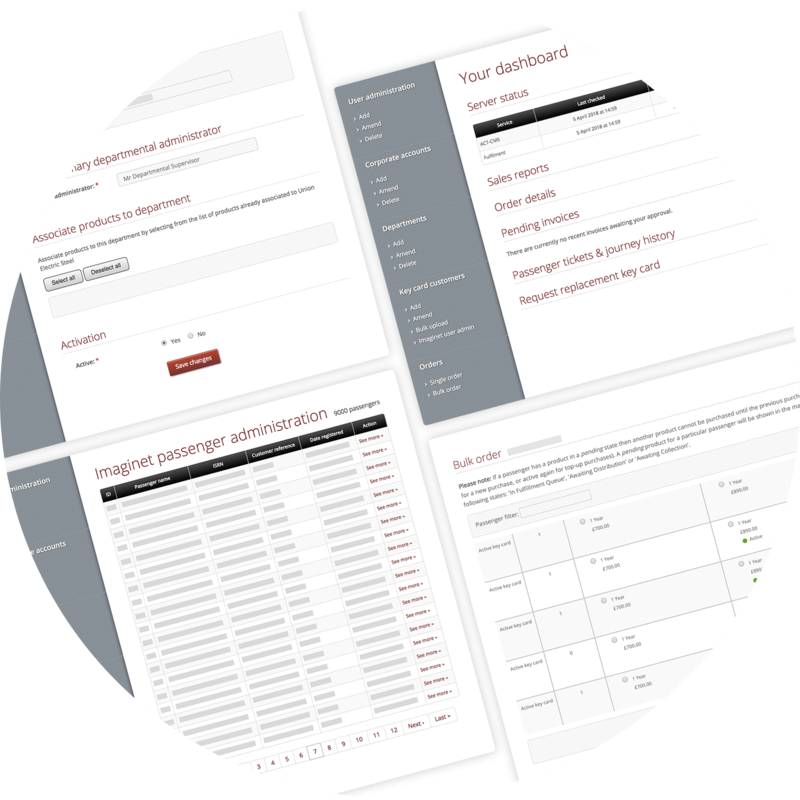 Tickets can be added in bulk and invoicing means that organisations can budget on a monthly basis. What type of smartcards can be registered on your portal? A smartcard portal can offer any number of card types dependent on your scheme and tickets available. So your scheme could give out blank cards that can be registered on-line later, photo-cards for children, young people and students, adult cards and cards for concessionary schemes. Can a smartcard portal help to reduce fraudulent travel? A smartcard portal can help reduce fraud by only selling the appropriate tickets available for that card, e.g. adults can’t buy child tickets. It also gives more control over lost or stolen tickets, as a smartcard can be hot-listed if reported missing, meaning that the card will no longer work during travel. What sorts of passenger transport data can be collected in a journey planning site? The new Thinktravel solution in development for Somerset and Gloucestershire County Councils will feature essential analytics to understand user behaviour, preferences and routes. Importantly for local authorities, the reporting will include gap analysis to highlight where demand is unmet to help shape future passenger transport planning. What passenger transport data can be provided in a website? The new Thinktravel solution in development for Somerset and Gloucestershire County Councils will integrate passenger transport data from 4 different sources, including internal social care and education booking systems for staff. The new website will also offer a Noticeboard where customers can post offers and wanted notices, which will be included in the search results, extending the service beyond the scheduled or on-demand services. Beyond this solution Imaginet has skills in integrating many other passenger information feeds including NRE and Nexus Alpha rail times, TransXchange bus schedule data, NaPTAN bus stops and real-time running data. How can customers pay for their smartcard tickets? 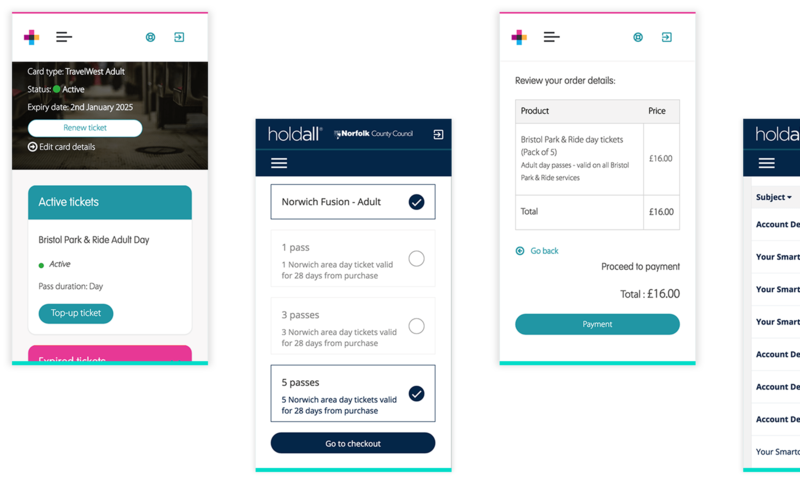 The portal can offer a variety of payment options for customers including card payments, continuous authority on a card for monthly ticket sales, Paypal and even invoicing on our enterprise level portals for corporates to manage smartcards in bulk. We’ve worked with organisations across the sector and continue to win awards for our work. We couldn't process that email address, please make sure it is entered correctly. Or if you want to talk to a real person, then Paula Dauncey, who is our Account Director for Transport, will be happy to discuss your requirements.